Twelfth-grader Naba Rahman was presented with ABC 7’s annual 7 Who Care award at a luncheon on July 14. This year, Rahman is the youngest of seven recognized volunteers from Sarasota and Manatee counties. 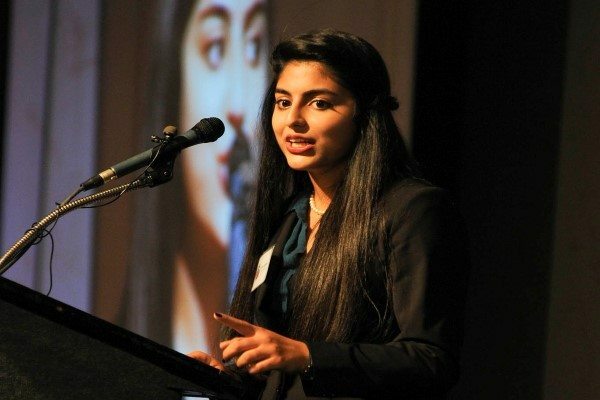 When Rahman was younger, her parents and her sister, ninth-grader Sana Rahman, would go on trips to Pakistan and volunteer. For Rahman, her most recent visit to Pakistan emphasized the importance of volunteering. During the summer of 2012, Rahman taught children at an S.O.S. Children’s village in Pakistan. Upon her return to the United States, Rahman and her sister developed the Youth Empowerment Leadership Program to teach related volunteering skills to young people. The program is currently at place in Chicago, Pakistan, Vancouver and Bolivia. “My main thing is to help people help themselves and help others,” Rahman said. Rahman works with numerous groups, including Sarasota Memorial Hospital, Peace Jam and Key Club. “She definitely has a lasting commitment, persistence and drive,” Peace Jam sponsor Bridgid Shannon said. Pine View Speech and Debate sponsor Shari Dodd had similar things to say about Rahman. “Naba is very approachable, likable, and intelligent,” she said. Rahman currently serves as the captain of the debate team’s Extemporaneous Speaking events.